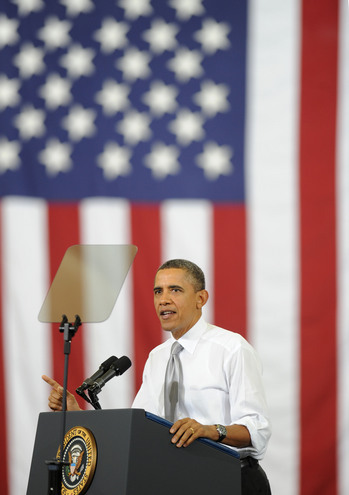 Posted on Fri, Jan 27, 2012 : 11:10 a.m.
President Barack Obama today said in Ann Arbor that he would offer a bucket of incentives devised to nudge states to restructure their college funding systems and force universities to keep tuition low. It reflects a general shift toward governments using dollars to incentivize change among cities, schools and other entities. “We still have by far the best network of colleges and universities in the world,” Obama said at a speech at the University of Michigan in Ann Arbor. “But the challenge is it’s getting tougher and tougher” to afford to attend college. The president pitched a new $1 billion extension of his Race to the Top program, which originally offered states dollars to adopt new laws enacting various reforms such as allowing more charter schools. Now, the initiative is aimed at states — dangling dollars in exchange for higher education reforms. Obama’s initiatives — including a threat to strip federal aid funding from public universities that don’t meet the administration’s demands — resemble incentives Gov. Rick Snyder implemented to force municipalities and schools to change employee benefit programs and adopt transparency initiatives. Snyder, in fact, has hinted that next month he will propose additional funding for Michigan public universities that meet certain objectives — such as, perhaps, improved graduation rates. Today’s proposal from Obama calls for similar incentives on a federal level. The administration’s $1 billion Race to the Top: College Affordability and Completion challenge would offer dollars to states that change their financing models and place an emphasis on graduation rates. But there’s a catch: the president also wants states to “maintain adequate levels of funding for higher education,” according to a Department of Education news release. To be sure, many states are sure to be reluctant to pursue a temporary influx in dollars in exchange for a permanent commitment of higher funding. But the president is also proposing new formulas for campus-based aid programs — including Supplemental Educational Opportunity Grants (SEOG), Perkins Loans and Work Study programs — to distribute aid to schools that keep tuition low and meet graduation targets. U.S. Secretary of Education Arne Duncan told reporters this morning at the event that the incentives are “carrots” to entice states to adopt reforms. The president’s address Friday morning comes three days after he said in the State of the Union address that college affordability needs to be a national priority. Obama wants Congress to prevent subsidized Stafford student loan interest rates from rising from 3.4 percent to 6.8 percent this summer, to double the number of work-study jobs available to college students and to make permanent the American Opportunity Tax Credit to help offset out-of-pocket tuition spending. Obama, reflecting on his own experience as a graduate of Columbia University and Harvard Law School, said student loans can be backbreaking. Fri, Jan 27, 2012 : 11:08 p.m.
Obama: &quot;No matter how much we subsidize it, sooner or later we're going to run out of money.&quot; Dude, where were you about 11 trillion dollars ago? Sun, Jan 29, 2012 : 4:11 a.m.
You are reciting the figures I gave you Sparty. Five trill for Bush, 11.2 trill (debt limit to 16.2 passed this week). You're welcome to argue over the 1.2 trillion - whether it's been spent yet or not - but we know it will be. Sun, Jan 29, 2012 : 3:33 a.m. The current deficit is approx $15 trillion inclusive of $5 trillion from Bush's wars alone plus his other major deficit spending program called Medicare Part D which is one of the most expensive programs to be added to government in over fifty years. Obama spending doesn't even begin to compare to that. Sat, Jan 28, 2012 : 9:10 p.m.
Why Sparty, you're so 2009. But since you want to go back there... Deficit is now at 16.2 trillion. Since you find it galling about the Bush &quot;5 trillion&quot; over eight years, you must be mighty upset about the match, and doubling, to 11 Trillion by Obama in three years. And just when the meds take effect for calming, Obama releases the 2013 budget on Feb 13. Better stock up! Sat, Jan 28, 2012 : 4:27 a.m.
You mean pre Bush's $5 trillion dollar Iraq and Afghanistan War costs? 1/3 the total of the entire US national debt ? Fri, Jan 27, 2012 : 5:22 p.m. The whole thing needs to be restructured We don't need all this brick and mortar to get an education, or $100 million dorms. With some good faculty, modest facilities, and significant on-line instruction, couldn't this be done as well for a fraction of the cost? The Federal Govt flooded the colleges and univ with student loan funds and indebted a generation to paying on these loans for half their working careers. So that did not work, let's come up with another scheme to f-it all up some other way by incentivising with Federal dollars. Nothing matters but Federal control. Fri, Jan 27, 2012 : 5:16 p.m.
&quot;....sooner or later we're going to run out of money. &quot; What? ..... I think i'm hearing things..... This is not Obama (or most politicians), now who was speaking today? ?